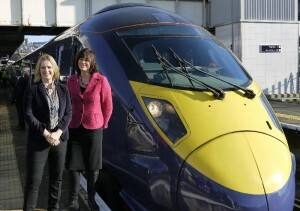 Amber Rudd and The Transport Minister Clare Perry with the Javelin at Hastings. Railfuture, and other local groups, are campaigning for higher line-speed, electrification, and selective redoubling of the MarshLink line between Hastings and Ashford International to enable more frequent services and shorter travel times to London via HS1 and to Brighton which will support regeneration of Hastings and Bexhill and improve access to towns and villages along the route. The consultants’ report on the strategic economic case for Javelins to Bexhill, via Rye and Hastings, commissioned jointly by East Sussex County Council, Hastings Borough Council and Rother District Council, was launched in Bexhill on Friday 9 October. Read more here. In his Summer Budget on 8th July 2015 the Chancellor of the Exchequer confirmed that “The Department for Transport has asked the rail industry to include extending High Speed 1 services to Hastings and Rye in the forthcoming Kent Route Study.” The full text can be seen in para.1.327 on page 69 of his Budget Report. At May’s Bexhill Town Forum we launched our campaign leaflet for High Speed Hastings, downloadable here. 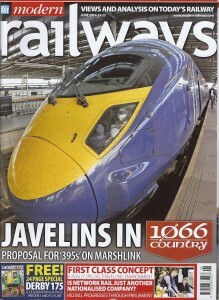 At the second Hastings Rail Summit on 30 January 2015 Network Rail and local stakeholders reported that feasibility studies and economic reviews of the project to bring HS1 Javelin services to Bexhill via Hastinga and Rye soon after 2019 had been completed in draft and were then expected to be published in April 2015. Rail Minister Claire Perry reaffirmed the commitment to develop the project – read her speech here, and a special Javelin train service was run to Hastings to commemorate the occasion. Full story at First Hastings Javelin. Travelling across or around East Sussex isn’t quick or easy. Roads are congested (there are few dual carriageways), bus services are slow and finish early, and rail services do not all link up. The MarshLink line runs between Hastings and Ashford. There are long single track sections between Ore and Rye and between Rye and Appledore. During the blockade to repair Ore Tunnel in early-2012, some improvements were made on the line to remove a line-speed restriction on an embankment outside Ashford station, and more work is required to remove other speed constraints, eg between Ore and Doleham currently limited to 40mph. There is an hourly ‘Ashford flyer’ service between Brighton and Ashford, which runs limited stop between Brighton and Rye, then all stops to Ashford. These services stop alternately at Three Oaks and Winchelsea, whilst only early morning and late night services stop at Ore and Doleham. On Sundays only the first and last (westbound only) services stop at Ore, Three Oaks, Doleham and Winchelsea. The line is not electrified; it is a ‘diesel island’ operated by 2-car Class 171 Turbostar units. Since these were introduced, patronage has grown sharply and peak services are now heavily overcrowded, but no extra stock is available. Network Rail’s London and South East Passenger Market Study observes that the impact on business travel, and therefore economic output, is relatively large for small incremental improvements to journey times in the range one to two hours (para. 7.2.1), and the impact on commuting, and therefore economic output is relatively large for small incremental improvements to journey times in the range 30 to 90 minutes. Railfuture worked with local rail user groups to agree consolidated feedback on the Market Study to East Sussex County Council, to inform their response to Network Rail. We pointed out that Hastings is 10 miles closer to London than Portsmouth, yet suffers a high level of unemployment because of its relative isolation. York can access London by rail in about the same time as Bexhill. There are three rail routes from Hastings to London offering five travel opportunities in the peak hour, with travel times between 1 hour 28 mins (at extra cost via Ashford/HS1) and 2 hours 17 mins. These are significantly slower than the rail journey from Portsmouth to London, for which the Market Study gives an aspiration of a 75-minute journey. Improvements to the journey time between Hastings and London would therefore confidently be expected to have a significant impact on the economy of the town – the prosperity of its residents and businesses – and attract more commuters to rail. Download the presentation or the full 80-page JRC report, which was a significant input to the East Sussex Rail Strategy and Action Plan and as explained in Christian Wolmar’s article in Rail magazine, the catalyst to start things happening. Railfuture contributed to the East Sussex Rail Strategy and Action Plan; in our response to the draft strategy we proposed changes to link the strategy objective of promoting economic growth to the required rail industry outputs of faster more frequent services on Marshlink and East Coastway. East Sussex County Council made electrifying and redoubling Marshlink and the Uckfield line its top priorities in the final version of its Rail Strategy and Action Plan, as building blocks for extending Javelin services to Hastings and reinstating Uckfield – Lewes. We have carried out a number of station counts which showed that there is a significant demand for travel between Winchelsea, Three Oaks and Hastings and beyond on Saturdays, which it is likely would be repeated on Sundays if a usable service were provided. In conjunction with our local affiliated rail user group Three Oaks and Winchelsea Action for Rail Transport (THWART), which is a member of the East Sussex Rail Alliance, we held a campaign meeting at Winchelseastation on Saturday 7 December 2013 to call for the return of a usable, all-day Sunday service. After a decade-long campaign, since all-day Sunday services last ran up to December 2005, THWART members and supporters will see the just reward for their tireless efforts on Sunday 13 December 2015 when all-day Sunday services return! Eight trains in each direction will serve each station, alternating between the two stations which will each have a train each way every two hours. Check the online Southern timetable now for journeys from Sunday 13 December. At the first Hastings Rail Summit on 31 March 2014 Network Rail committed to develop a project and to build the partnership with stakeholders needed to bring HS1 Javelin services to Hastings soon after 2019, and Railfuture presented Secretary of State for Transport Patrick McLoughlin the Shock and Ore picture to commemorate the occasion. Full story atHigh Speed Hastings. At the Hastings Rail Summit, Network Rail’s Route Managing Director for the South East Dave Ward committed to develop the project to bring HS1 services to Hastings during Control Period 5, and to build the partnership with stakeholders needed to deliver the project in Control Period 6. High-speed Javelin trains running between London St. Pancras and Bexhill via Ashford International will achieve a journey time between London St Pancras and Hastings of just 68 minutes, compared to over 100 minutes via Tonbridge in the peak today. The new service for Hastings and Bexhill will also reduce crowding for passengers on the line through Tunbridge Wells, Tonbridge and Sevenoaks. Remodelling junctions at Ashford which will allow Marshlink line trains to access HS1, to enable Javelin services between Hastings and London St Pancras in 68 minutes, and between Bexhill and London St Pancras in 78 minutes, which will attract more passengers and so provide the business case for electrification. Railfuture will continue to work in partnership with East Sussex, Hastings and Rother Councils, Kent, the Local Enterprise Partnership, Amber Rudd MP and Network Rail to ensure that this promised project is delivered. We will continue to build the partnership to achieve East Sussex’s second priority of electrifying the Uckfield line and reinstating between Uckfield-Lewes, enabling through services from London via the Weald to Brighton and Sussex coast destinations. If you support the Railfuture campaign, wish to keep up-to-date with our activities, or find out more about how YOU can play your part, please join us at Sussex and Coastway.